We left Zion National Park out to Route 89 and north to Scenic Route 12, a National Scenic Byway. 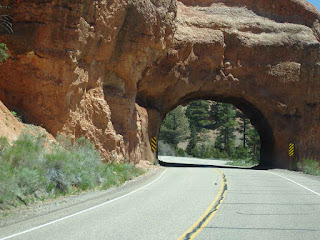 And it is a very scenic , interesting route up to Bryce and beyond toward Capitol Reef. 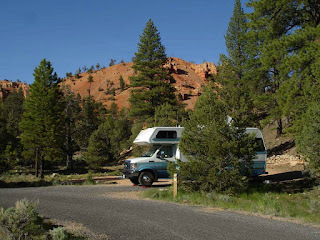 Just past the Red Canyon visitor's center, we saw the entrance to Red Canyon National Forest Campground. 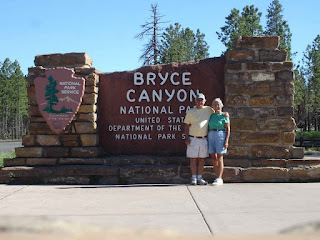 Knowing the national park campgrounds in Bryce were supposedly full, we took a look------and WOW! The campground hosts were quite friendly and helpful. The spacing was great with good privacy. As you see, there was a concrete pad and barbecue grill and fire pit. Unfortunately, there was a ban on charcoal and wood fires--fire danger. 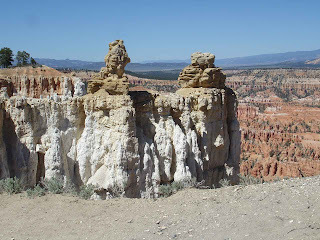 Our view was of the Red Canyon hoodoos--a kind of rock spire that results from erosion. 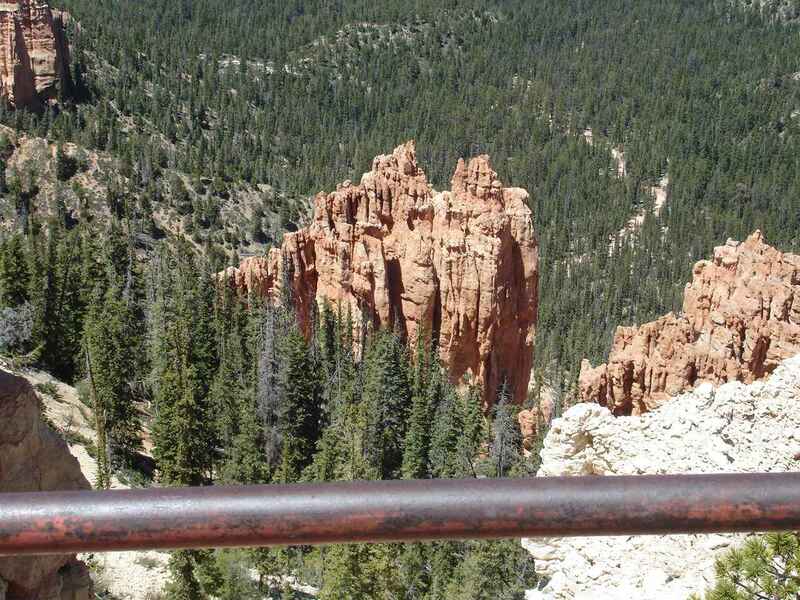 It was a fairly short distance to Bryce and one of the first encounters is another rock tunnel. Plenty of room in these. 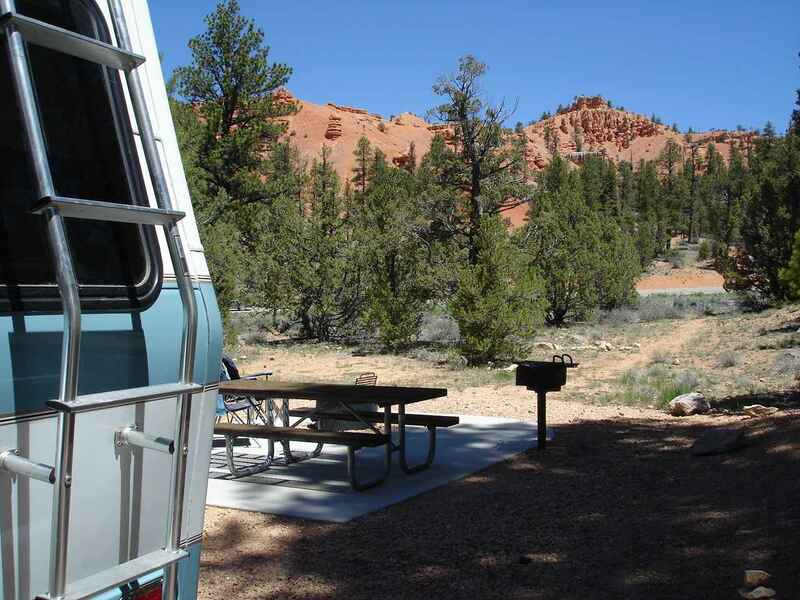 By the way, we discovered that our National Forest Campground was much nicer than what we saw in Bryce. 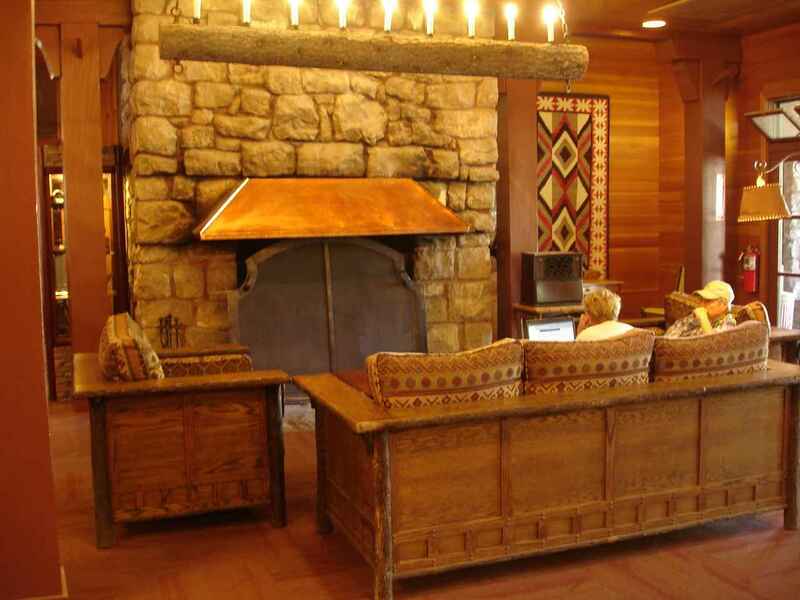 Also, it was only $7.50 per night with our Senior Pass. There was also a very nice bakery on the way!! 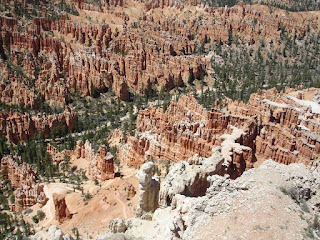 Some of the interesting formations included spires and cave formations--again from erosion. 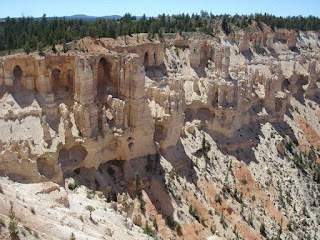 The canyon is deep--not as deep as Grand Canyon and offers long views. Up to 200 miles. The visibility is usually very good. There is much less pollution here affecting the long views. 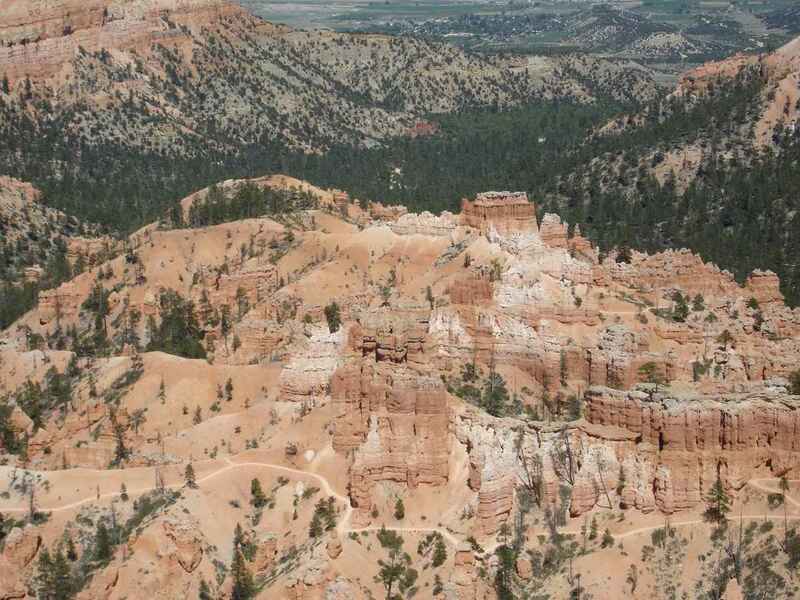 There are many hiking trails in Bryce Canyon as well as horse and mule rides. From here, we could see some of the people and horses on the trails. The longer we looked, the more unusual formations we would see. Different shades of rock for different minerals. 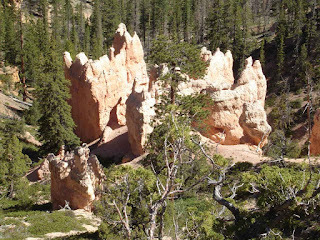 Besides hoodoos and spires and caves, we found some formations that would look like a castle. Inside Bryce Canyon Lodge was a very comfortable looking fireplace and lounge. One of our fellow campers at Red Canyon indicated that the restaurant at Bryce Canyon Lodge was one of the best. We had traveled the first day on the shuttle within the park. 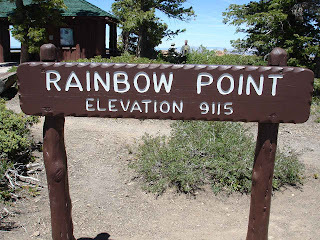 The second day, we drove beyond the shuttle route to the rest of the 18 mile scenic road. 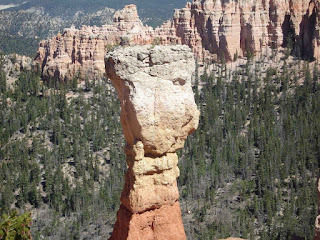 There are some great hikes on the rim of the canyon. Like in Grand Canyon, some of the hikes off the rim can be quite steep. 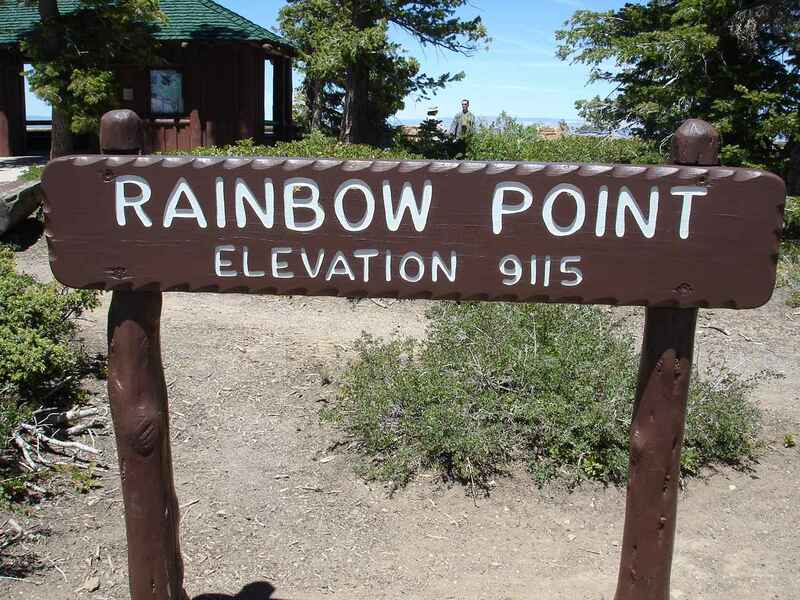 We had a great view from Rainbow Point--note the elevation at 9,115 feet. We did our share of long hikes on both days. Jan is out at the edge, checking the extended vista. The hoodoos take on many different shapes. Sometimes, there are steep walls dividing tall examples. Sometimes, you can make up your own names for the spires. We saw a face in this one. Plus, we were wondering how long it does take for these top-heavy boulders to fall. 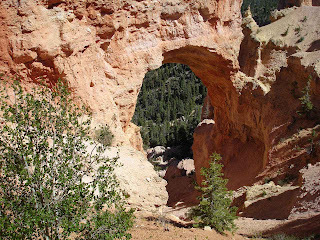 Across the US are a number of examples of natural bridges. The info here indicated that a natural bridge is formed by running water. 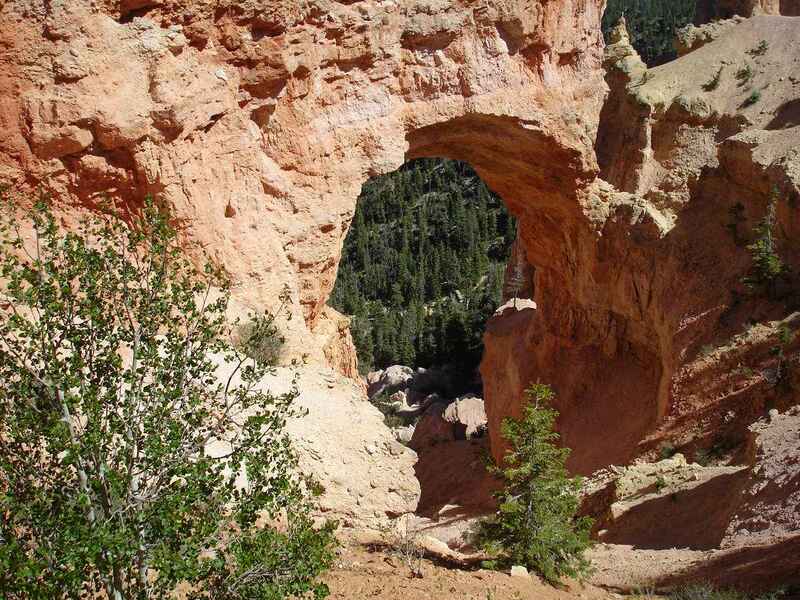 So, this is not really a natural bridge,even though it is called a natural bridge, because it was caused by erosion. Another formation in the woods that looks like the ruins of some old castle. We enjoyed our tours of Bryce. 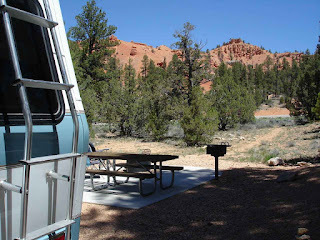 And we enjoyed our campground so much that we added another night. Even though we had no cell phone coverage whatsoever. 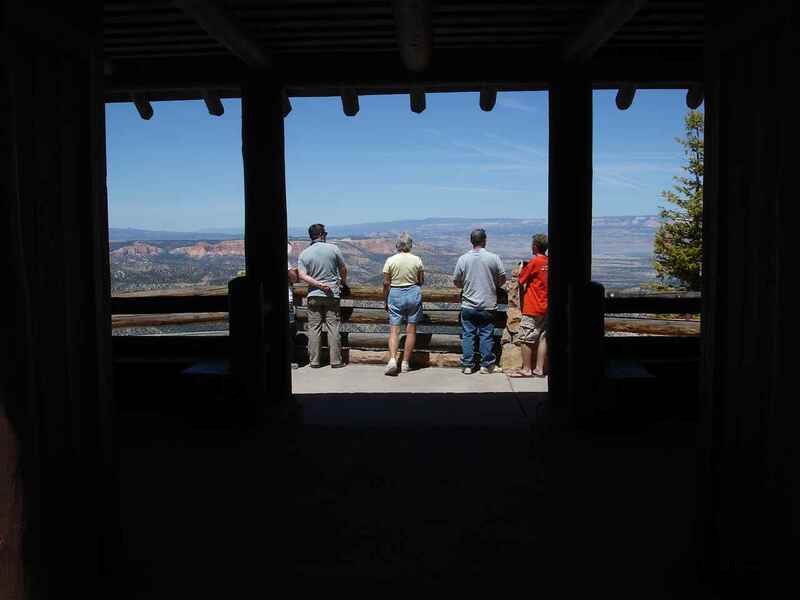 The Bryce Canyon Lodge rests on a beautiful forested Mesa on the rim of Bryce Canyon National Park, Utah. This national park lodge is known for its unique geologic features.